Thurgood Marshall Almost Didn't Become the First Black Supreme Court Justice -- and 10 Other Things Most People Don't Know About Him! 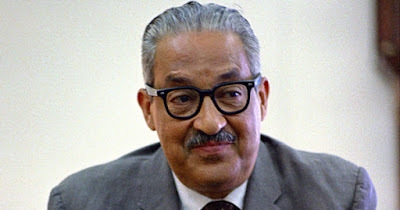 Thurgood Marshall, born in Baltimore, Maryland on July 2, 1908 was the first African American who became a U.S. Supreme Court Justice, but this almost didn't happen because his original plan was to study dentistry at Lincoln University. But he did end up going to law school, and also went on to become a strong supporter of the civil rights movement who is still remembered today. But a lot of his story is not told in history books! #1 - His real name was Thoroughgood but he changed it to Thurgood because he thought his original name was just too long. #2 - While most people legally change their names as adults, he changed his name when he was only in the second grade. #3 - He attended law school at Howard University, and graduated first in his class. #4 - He wanted to attend University of Maryland’s law school, but the university would not allow Blacks to apply at that time. #5 - He was known as a real prankster. In fact, he was suspended twice for playing jokes on others. #6 - Right out of law school, the NAACP brought him on as legal counsel and within a few short years made him the organization's chief counsel. #7 - In 1967, he became the first Black person to hold a position in the U.S. Supreme Court. He was nominated by President Lyndon B. Johnson. #8 - Marshall was reportedly good friends with former FBI director J. Edgar Hoover, and even worked with him on occasions. #9 - He was a Supreme Court Justice from 1967 to 1991 when he retired. He represented and won more cases before the United States Supreme Court than any other American. #10 - He died in 1993, but that same year was awarded posthumously the Presidential Medal of Freedom, the nation’s highest civilian honor. This Former Slave Was Making Cars Long Before Henry Ford — More Than 100 Years Ago!